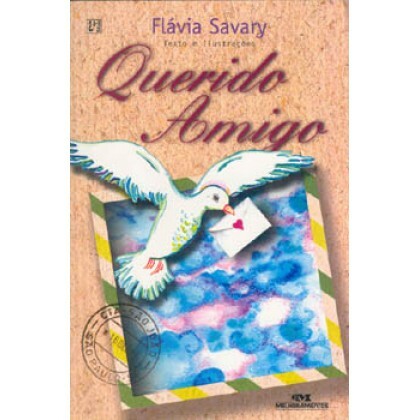 JUVENILE'S BOOK: "QUERIDO AMIGO" (“DEAR FRIEND”) BY FLÁVIA SAVARY — A NEW / Mint (not used) copy of this beautiful all family's Book! 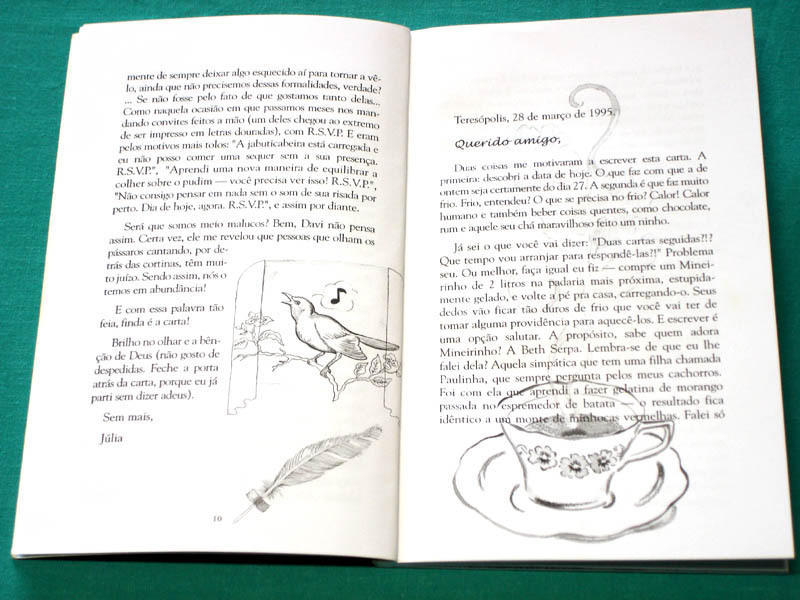 Plenty of rich illustrations by the author, Flávia Savary, and introduced by Terezinha Éboli! 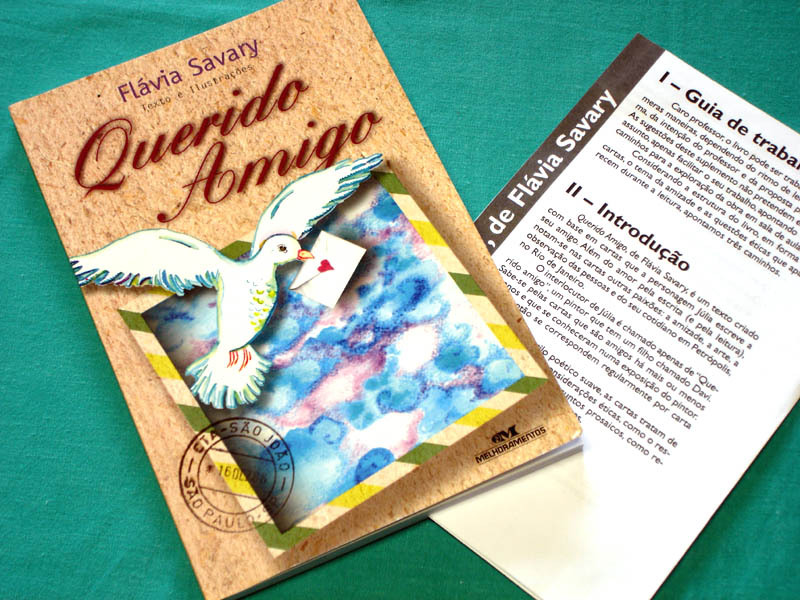 At the beginning of it, “QUERIDO AMIGO” (“Dear Friend”) was not meant to be a book. The author, who meant to have fun, invented an imaginary friend to send letters. From its half on, nevertheless, the book created its own wings and decided a different destiny for itself and became a delightful book! In the preface, the famous writer Terezinha Éboli reveals that to write letters (writing, in general, as the code to get into the daydreamers land) is an old passion of the author, who masters this art like few. The romance is filled with poetic tour de force and powerful imagination, resulting in a passionate hymn to friendship. The drawings, made by the author, are delicate visual remarks to the most impressive parts of the text. An unforgettable reading and gift! The author was born in Rio de Janeiro City, Brazil. She was graduated in Portuguese-English, at the Federal University of Rio de Janeiro, in 1980. She received, up to now, almost 80 literary national and international prizes in so many different genres as drama, poetry, tales, romances, chronicles for adults and children. As an illustrator and artist, her name and work were included in many exhibitions and art dictionaries throughout the world. Edited books: É DE MORTE! (“It’s like dying!”), FTD Publishing House, SP, 2014. ARCO DA VELHA DE ROUPA NOVA (“Old tales in brand new clothes”), illustrated by Jaguar, Cidade Nova Publishing House, SP, 2014. PIPAROTES DE POESIA (“Fillips of poetry”), illustrated by Lucas França, Dimensão Publishing House, MG, 2014. HISTÓRIAS DE FOGO (“Fire histories”), illustrated by Veruchka Guerra, Paulus Publishing House, SP, 2013. DE CARONA NA CAROCHINHA (“Hitch-hiking on Carochinha”), illustrated by Laurent Cardon, Globo Publishing House, SP, 2012. MEUS OLHOS SÃO TEUS OLHOS (“My eyes are your eyes”), illustrated by Alexandre Rampazo, Positivo Publishing House, PR, 2011. A ROSA QUE GIRA A RODA (“The Rose that rotates the wheel”), illustrated by Rosinha Campos, Dimensão Publishing House, MG, 2011 (Selected to Bolonha’s 49ª Children books fair, Italy, plus FNLIJ prize, Theater for children, RJ, both in 2012). CADÊ? (“Where?”), illustrated by Alexandre Camanho Positivo Publishing House, PR, 2010. O HERÓI (“The hero”), illustrated by Jean-Claude Alphen Positivo Publishing House, PR, 2010. CALMA, VÍTOR HUGO! (“Take it easy, Victor Hugo!”), illustrated by Rubem Filho, Mundo Mirim Publishing House, SP, 2010. 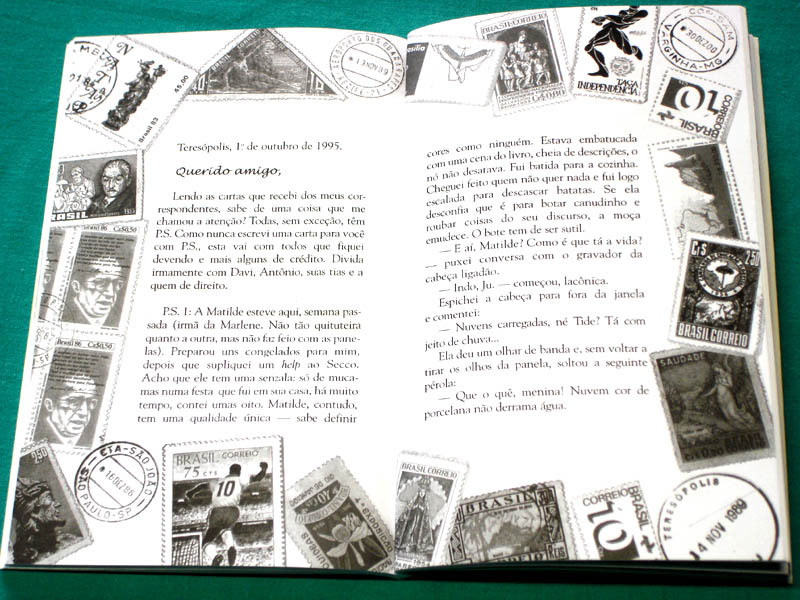 DIÁRIO INVENTADO (“Invented diary”), Paintings by Carolina Monteiro, FTD Publishing House, SP, 2010. SANGUE DE DRAGÃO (“Dragon’s blood”), illustrated by Rogério Borges and introduced by the author, FTD Publishing House, SP, 2009 (Selected to Bolonha’s 47ª Children books fair, Italy, 2010). SIMPI E O DESAFIO DO DRAGÃO (“Simpi and the dragon’s challenge”), illustrated by Ana Raquel and introduced by Nani, Autêntica Publishing House, MG, 2009. O ROQUE DA CIGARRA (“The cicada’s rock”), illustrated by Ivan Zigg, Salesiana Publishing House, SP, 2008. ANABELA PROCURA E ACHA MAIS DO QUE PROCURA (“Anabela looks for and finds more than she looks for”), illustrated by João Lin, Dimensão Publishing House, MG, 2007. CAMINHANDO, EU VOU! (“Here I go!”), illustrated by Maurício Veneza, Salesiana Publishing House, SP, 2007. AS ESCOLHAS DE RAFAEL (“Raphael’s choices”), illustrated by Filipe Rocha and introduced by Chico Alencar, Salesiana Publishing House, SP, 2007. LENDAS DA AMAZÔNIA ...E É ASSIM ATÉ HOJE (“Amazon’s legends... and it’s like that till today”), illustrated by Tati Móes and introduced by the author, Salesiana Publishing House, SP, 2006 (Highly recomended seal for children, from the FNLIJ - National foundation book for children and youngsters). OITAVO ANIVERSÁRIO, PRIMEIRO AMOR (“Eighteenth birthday, first love”), illustrated by Rogério Soud and introduced by Ziraldo, Melhoramentos Publishing House, SP, 2005; and the awarded in the Guimarães Rosa 2005 Literary Context, France, MENINOS, EU VI! (“Boy, have I seen!”), illustrated by Rogério Soud and introduced by Joel Rufino dos Santos, Salesiana Publishing House, SP. VINTE CANTOS DE SEREIA (“Twenty mermaid songs”), illustrated by Suppa and introduced by Olga Savary, Dimensão Publishing House, MG; MEMÓRIA DE BALEIA (“Whale’s memory”), illustrated by Marco Aragão, Salesiana Publishing House, SP, and A ARCA DO TESOURO (“The arch of treasure”), illustrated by Jonas Ribeiro, Salesiana Publishing House, SP, all published in 2004. QUERIDO AMIGO (“Dear friend”), Melhoramentos Publishing House, SP, 2002, and 25 SINOS DE ACORDAR NATAL (“25 bells to wake up Christmas”), Salesiana Publishing House, SP, 2001, both illustrated by the author, who also participated of more than 40 anthologies worldwide.